Cottage of 70 m², 3 room (s) View on sea and the volcano of Soufrière. Guests can enjoy a balcony with sea views and there is a 3000 m² tropical garden and a terrace with seating and dining areas. A barbecue will be at your disposal to enjoy the sunny days with family. Air conditioning allows you to enjoy the best the hottest days the lodging. My husband I spent a wonderful week at the beautiful cottage owned by Evelyne and Christian. It is located on the edge of St. Claude, an historic and scenic small town above Guadeloupe’s capital city, Basse-Terre, with all the amenities you might require. It is not a touristy area at all, which we especially appreciated. We were just minutes from the coast and spent many hours driving to pretty beaches for swimming and snorkeling, hiking trails, and interesting spots such as a rum distillery, coffee museum and Jacques Cousteau Marine Reserve. French is the preferred language. Evelyne and Christian can speak a little English and we speak a little French so we managed just fine. Also since the WiFi was excellent, we were able to use Google Translate to assist us. La Vieille Sucrerie is a newly built, spotless, all wood cottage with two air-conditioned bedrooms (very comfortable bed and linens), a shower room, separate toilet room, and a kitchen plus dining and living areas on a large covered deck. The view from the deck is of treed hills with a deep ravine below and the ocean in the distance. You can hear the river rushing, birds, and not much else. You approach the cottage through a gate and down a steep driveway. We kept our car at the top and walked down the easy steps to the cottage. While the cottage is on one side of the property and Evelyne and Christian’s house is on the other side, we felt we were quite private. The garden below the cottage is very attractive with many native plants and trees. Christian gave us a tour that was worthy of a botanic garden tour guide. We enjoy cooking with local products and were not disappointed at the variety and quality. There is fresh locally grown fruit and vegetables and locally caught fish in abundance. Roadside stands sell grilled chicken and ribs, and the nearby supermarket had everything else we needed. We especially appreciated the French bread, pastries and wine! The kitchen is well-equipped and, while small, is nicely appointed. Dining every night on the deck, watching the sun go down, was a real pleasure. Finally, our hosts Evelyne and Christian couldn’t have been more friendly, considerate and helpful. We have travelled the world renting from owners and highly recommend staying at La Vieille Sucrerie. This is a beautiful location with wonderful view. Christian and Evelyn are wonderful and welcoming. Its immaculate and well equipped we wouldn't hesitate to stay here again. Language barrier and all. A really superb place to stay! We can thoroughly recommend this excellent accommodation. The chalet cottage is beautifully designed and constructed and very well equipped to an extremely high standard to allow you to have a wonderful holiday. The location of the chalet in Evelyne and Christian’s garden is very attractive with a wonderful view from the open deck across the garden towards the sea. Our hosts, Evelyne and Christian, were extremely helpful and charming people and they were very happy to answer any questions that we had. Christian gave us a very informative walk around his lovely garden and we really enjoyed sampling the fantastic fruit that he grows. The location of the cottage is excellent for exploring the southern part of Basse Terre with the potential for lots of interesting walks and trips to the Isles des Saintes. We had a lovely holiday here and we’re sure you would too. It’s worth noting that the access drive is quite steep and better suited to a small, well-powered car than to a large one. Merci Pam et Mike pour cet avis élogieux qui nous encourage à poursuivre notre activité pour le bien-être de nos vacanciers. Nous avons été honoré de vous recevoir et avons apprécié votre gentillesse et votre courtoisie ainsi que les efforts que vous avez fait en échangeant en Français afin d'aplanir entre nous la barrière de la "Langue" Nous sommes conscient que notre Anglais reste de loin à améliorer par rapport à votre Français. A bientôt peut-être en Angleterre ? Although we had a minor language barrier we were very happy to have met Christian and Evelyn. They were very helpful with my family and I the entire trip. The "bungalow" was in excellent condition and was very welcoming. It is set in a garden and the owners even had fresh fruit for us from the garden upon our arrival. The view of the Caribbean from our balcony was unbelievable. They even were nice enough to have a crib for our infant daughter. I would love to stay here again and I highly, highly recommend it for anyone. Bring a good map though. It was a little difficult to find the first night but I blame our airline for getting us in so late. Un lieu magique et de belles rencontres ! Accueil chaleureux d'Evelyne et Christian. Soucieux du bien-être de leurs hôtes, on ne manque de rien à la vieille sucrerie ! La maison est à la fois belle et pratique même pour notre famille de 5 personnes. Le jardin magnifique est à explorer avec Christian qui nous transmet sa passion... les enfants, mais aussi les parents apprennent beaucoup ! Quant à Evelyne, ses créations sont superbes... atelier a visiter ! 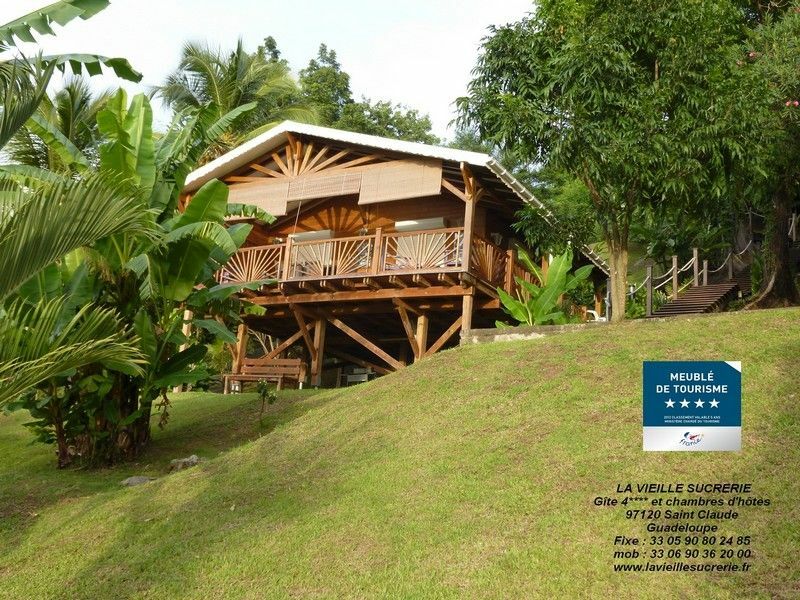 L'emplacement est idéal pour visiter toute la basse terre avec ses Cascades, rivières, randonnées en forêt tropicale et bien sur la Soufriere ! Mais aussi de belles plages de sable volcanique où l'on rencontre des poissons tropicaux et des iguanes... un beau marché et tous les commerces nécessaires à 5 minutes. Notre seul regret... avoir du partir ! Merci David et Carine pour cet avis chaleureux et plein de gentillesse. Nous sommes ravis d'avoir participé à la réussite de vos vacances en vous apportant notre expérience dans la découverte de notre belle île. Das wunderschöne Holzhaus fühlt sich in dem großen Garten wie ein echtes Baumhaus an. Christian und Evelyne haben uns sehr freundlich empfangen und waren jeder Zeit für uns ansprechbar. Das Esszimmer mit integrierter Küche ist auf der Veranda und man kann von dort bis zum Meer hinunter sehen. Im Garten hört man die tropischen Vögel zwitschern und Eidechsen huschen über das Geländer. Ein karibischer Traum der sehr zu empfehlen ist! You can go hiking in the heart of the National Park of Guadeloupe to the Soufriere volcano, swim in the Caribbean Sea and visit the Saintes islands while enjoying all the amenities offered by the proximity of the city of Lower -Terre.